Romantic Suspense? Blood Ties is On Sale for $.99! Amazon has put Blood Ties on sale for $.99! This is an unannounced sale and I have absolutely no idea when it will end, so grab my PG-rated romantic suspense now before the Zon changes their mind. If you can’t get it free through Kindle Unlimited this is your moment to read this highly rated novella for less than a dollar! Roselyn Ridge has always wanted to find her father. When she takes a website DNA test, she learns she has a Pacific Islander grandparent. After she attempts to learn more, strange things start to happen. Drug dealers appear in her quiet Sacramento neighborhood. Someone tries to run her over when she’s out jogging. Meanwhile, her mysterious father’s widow, Healani Chang, invites her for a visit to Hilo. Nothing interesting has ever happened to Roselyn before, but she’s beginning to think ignorance was bliss. Now, if she doesn’t solve the mystery of her father, she risks not surviving to start a family of her own with the attractive Hawaiian man she’s just started dating. Help Krinar Revenge win the allauthor.com Cover of the Month contest! I’m number five going into the second week and I need your help! If you liked the cover of my book, The Krinar Chronicles: Krinar Revenge (Kindle Worlds Novella), please vote for it for the Cover of the Month contest on AllAuthor! I am grateful for all your support! 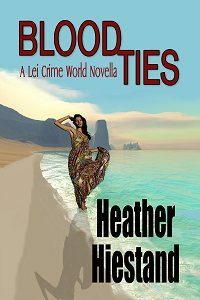 This entry was posted in Book info, Contest, Sale and tagged blood ties, heather hiestand, krinar revenge, romantic suspense on March 9, 2018 by Heather.